Mirboo Shire (1894-1994), an area of 255 sq km, was in the Strzelecki Ranges, west Gippsland. Its administrative centre, Mirboo North, is south of Trafalgar and 130 km south-east of Melbourne. The shire was formed on 13 April 1894. Before then its area had been administered by Narracan and Woorayl Shire Councils and for a short time Woorayl Shire was headquartered at Mirboo North. Mirboo Shire was situated on hilly fertile land with locally heavy rainfall in its north that shaded to a quarter less in the south of the shire. Farming was dairying in the north and fat-lamb raising in the less damp south. There were dairy factories at Mirboo North (1893-1973) and, outside the shire, at Leongatha, Dumbalk, Yinnar and Morwell. A railway line ran from Morwell to Mirboo North (1886-1974) for transporting dairy produce and livestock. There were numerous hill settlements, most with schools at some time: Allambee East (1928-53), Hallston (1886-1991), Mardan (1884-1993), Mardan South (1892-), Mardan West (1890-92), Mirboo (1890-99, 1902-67), Mirboo East (c1906-1970s), Mirboo South (1889-1919) and Mirboo West (1900-27). As early as the 1930s the Victorian Forests commission began buying up abandoned hill farms for forestry. Planting sped up in the early postwar years, both softwood and eucalypt trees. In the former Mirboo shire there are extensive plantations north-east of Mirboo North and near Allambee South/Hillston. 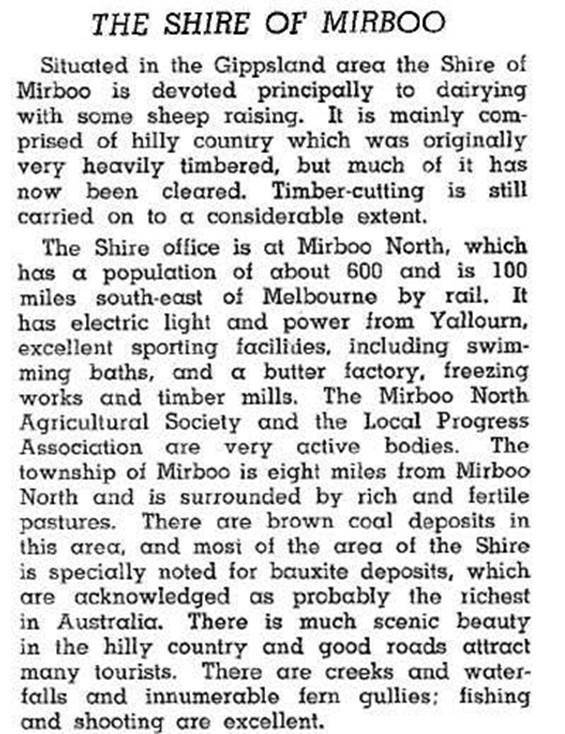 For most of the period 1900-70 the shire’s main town, Mirboo North, had about one third of the shire’s population. In 1986 Mirboo North had 43% of the shire’s population. In 1994 Mirboo shire had 15,500 milk cattle, 9230 meat cattle and 15,600 sheep and lambs.